I am 31 years old Danish guy living in Stockholm with a partner. I have a masters degree en environmental biologi and geography from Roskilde University, Denmark. However I work at a IT hosting company, Itadel A/S, as a site manager. Which means I work with the physical hardware in datacenters. I like to work with computers, but in my current job I don't have the opportunity to create stuff. I would like that, and I think learning to program could help me in my goal to work with computers AND create. What was the best part of being part of the Craft Academy Bootcamp? The best, and most fun part of the camp, is when the things you've been taught work when you use them in your projects. When your tests are going green. The hardest part is to balance the commitment to the camp and your social life. I was aware from the beginning that there won't be much time for sociall activities, but still, when you have a partner, there's a need to balance how you spend your time. That can be tough at times. She's happy it's over. What are your plans now that the camp is over? The first two weeks after the camp will be spent in the sun. We are going on vacation. After 3 months in a basement, working on a computer, I need a bit of sun. After that, I hope to find a position as a Junior Developer. It's important that I find a company that is commited to agile methodologies, that they practice TDD and Pair Programming, but also that they are prepared to work with me and teach me stuff. What would be your advice to anyone that would like to leant to code? 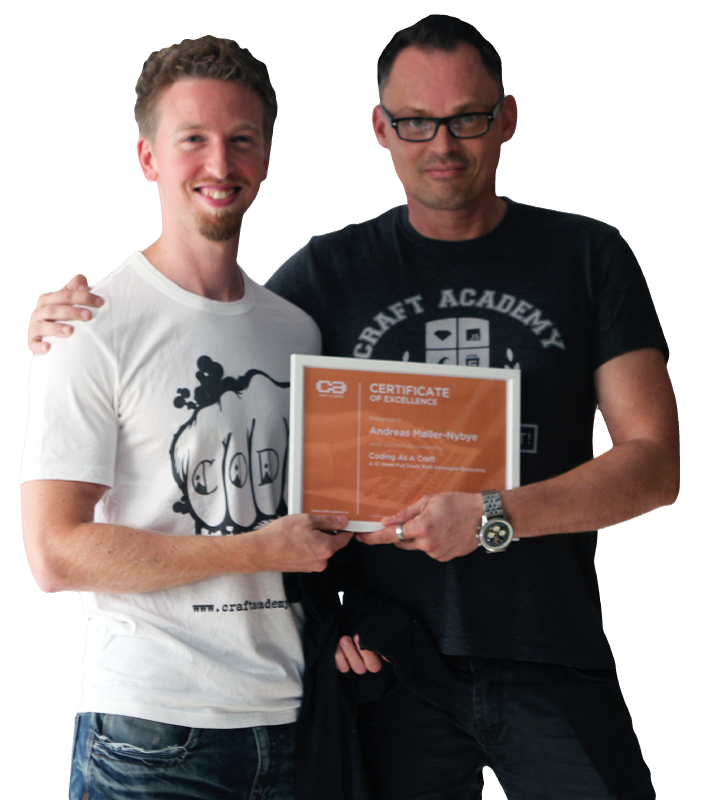 My advice to anyone who is eager to learn programming is to sign up for Craft Academy. It's a wonderful experience - both personally and professionally. Do that.